TUSCALOOSA, Ala. — Nine University of Alabama apparel design students are creating garments inspired by the rediscovered sketches of Hedy Strnad, a Jewish Czech dress designer who died in the Holocaust. The garments will be featured in “Inspirations from the Past,” a fashion show hosted by Gus Mayer at The Summit in Birmingham Jan. 27 at 6 p.m.
Hedy Strnad, a talented dressmaker in Prague in the 1930s, wasn’t able to escape Nazi-occupied Czechoslovakia, but some of her fashion designs did. In March 1939, Hitler’s army invaded Czechoslovakia, and the worst fears of Czech Jews became reality. In December, Hedy’s husband, Paul, wrote to his cousin in Milwaukee asking for help in acquiring visas for himself and his wife to immigrate to the US. He included eight samples of Hedy’s dress designs to demonstrate that she would employable in the American apparel industry. Sadly, the cousin’s efforts to help Paul and Hedy immigrate were unsuccessful, and the couple died during the Holocaust. For decades, the letters and Hedy’s sketches were stored away in a box in the cousin’s attic, where they were discovered in 1997. They were donated to Jewish Museum Milwaukee, which teamed with the costume shop at Milwaukee Repertory Theater to turn sketches into garments. 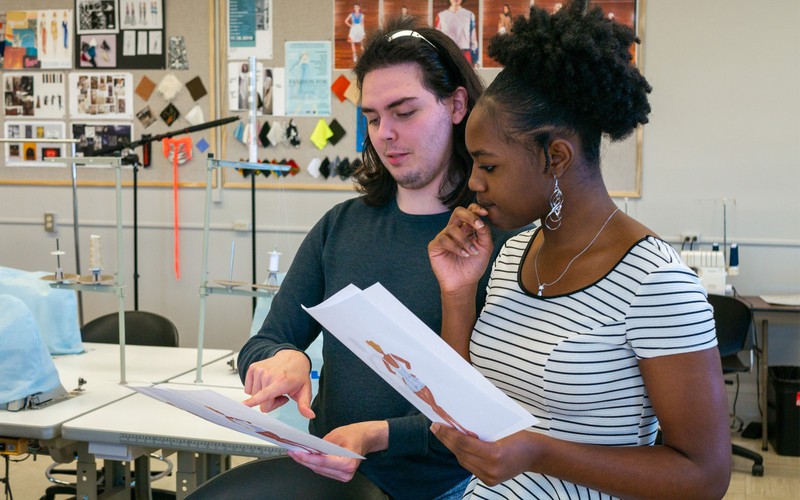 The Birmingham Holocaust Education Center approached UA’s College of Human Environmental Sciences about involving their apparel design students in a project to create contemporary garments inspired by Hedy’s sketches. The project moved forward under the direction of UA apparel design instructors Brian Taylor and Paula Robinson. Taking inspiration from different aspects of the sketches – silhouette, color palette, details, etc. – the nine participating students are using their creativity and skill to interpret Hedy’s esthetic in fashions for today’s woman. Student designers include Jeff Austin, of Birmingham; Mary Rives Drake, of Birmingham; La’Shandra Garner, of Millbrook; Trevor Hill, of Kennesaw, Georgia; Jennica McMillan, of Birmingham; Kaitlyn Sarao, of Coral Springs, Florida; Millie Steed, of Huntsville; Kailyn Thomas, of Tuscaloosa; and Pang Vang, of Chesnee, South Carolina. The students’ work will be featured on the runway along with looks from Gus Mayer’s collection selected by stylist Tracy James of Chic Made Simple. The show is open to the public; tickets are $36 and may be purchased at www.bhecinfo.org/fashion.